Kids are healthier and safer than ever. Stop traumatizing them. Kids, in fact, are safer and healthier in contemporary America than they’ve ever been in our history. Almost all the data offered by the Centers of Disease Control and Prevention (CDC) and other studies regarding the lives of children is trending in a positive direction. Putting shootings in context isn’t the same as dismissing them. It’s undeniable that horrifying mass shootings have a bigger impression on the American psyche than the random firearm crimes that actually drive the homicide rate. There’s an inherent evil in the act of a mass shooting that is incomprehensible for any normal person to process. That’s no excuse for the cynical exploitation of these events. There’s also no doubt that it’s difficult to debate the problem in good faith, mostly because people keep changing the definition of “mass shooting” to serve their political bias. But even if we take the most liberal definition of the phrase, mass shootings are “one of the rarest mortality risks imaginable,” as Cato’s Alan Reynolds has pointed out. From 1982 to early 2018, mass shootings accounted for around 23 deaths per year. Not kids; all deaths. An American has a far higher chance of drowning in a swimming pool (3,500 per year) or perishing on a bike (over 700) or being punched, knifed, or kicked to death (over 1,800.) To put it in perspective: right now, there are around 42 million young people between the ages of 10 and 19 in the country. If you want to talk about a greatest threat to American mortality, you should be talking about the 250,000 people—or 10 percent of all deaths—in the United States that can likely be attributed to medical mistakes, according to a recent Johns Hopkins study. If kids should be petrified about anything, it’s getting into a car with parents who are taking them to a hospital for routine surgery. If parents should be scared of anything, it’s the mental health of their kids. Child suicide rates have been slightly rising over the past few years. 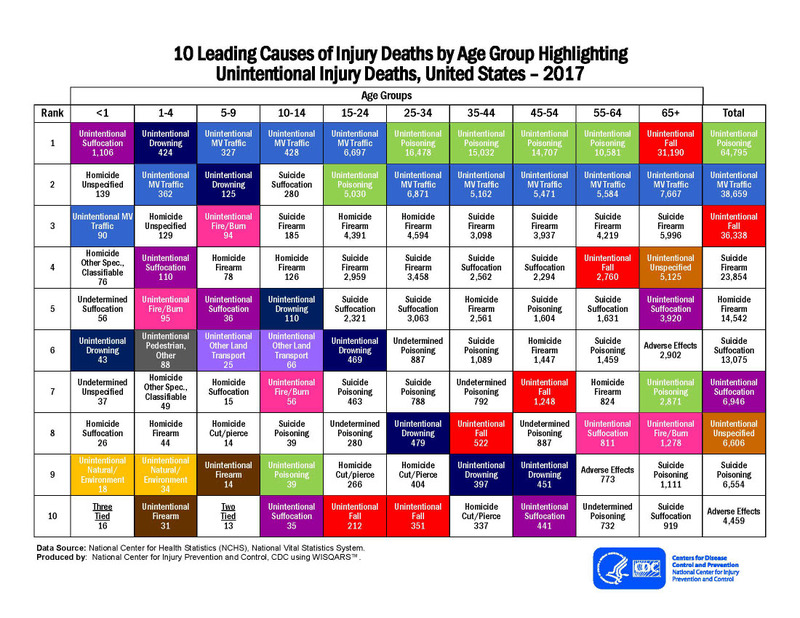 Yet, more young people from the ages of 15-24 (the CDC has this age group as a data set, which doesn’t really tell the full story because deaths skew towards the young adults rather than the teens) die from “unintentional poisoning”—or drug overdoses—than gun homicides or suicides. Now, a lot of people like to conflate suicide deaths with gun homicides for political purposes. There have been a number of efforts trying to convince you that the suicide rate, not particularly high in the United States, is a product of gun culture. Yet many nations with far higher reported suicide rates—South Korea, Japan, Hungary, Finland—also have strict firearm restrictions. If guns were the driving factor, why did firearm-related suicides and homicides precipitously drop from the 1990s to the mid-2010s, exactly when gun ownership exploded? All deaths among 10- to 19-year-olds, accidental or not, have declined almost 50 percent between 1999 and 2013. The rate ticked up slightly from 2013 to 2016, mirroring a national trend for adults. The majority of the increase in deaths for 17- to 19-year-olds was driven by car crashes, poisoning, and drowning. Even schools are safer now than they were in the ’90s, and school shootings are less common than they used to be, according to researchers at Northeastern. None of this is to say that every death isn’t a tragedy or that we shouldn’t come up with reasonable methods to try and curb criminality. The problem is that American politicians, in an effort to gain power, like to act as if we live in a dystopian world of murder and mayhem when really the opposite is true. Swalwell isn’t a serious candidate, but in many ways he’s the embodiment of Alexandria Ocasio-Cortez’s leftist position that people should be more concerned with what is “morally right” than “factually correct.” His intent is to scare Americans so he can push a ban on guns. “Military-style semiautomatic assault weapons” is a neologism without any meaning. The vast majority of citizens do not have access to anything resembling a “military-style assault weapon.” One imagines that the semiautomatic assault weapons Swalwell is referring to are the AR-15s, which are rarely used in crimes and never by the military. Not only would it be an infringement on a constitutional right to ban—the Heller decision found that the Second Amendment protected weapons “in common use by law-abiding citizens;” the AR-15, the most popular rifle in America, clearly meets this criteria—it would do little to nothing to stop homicides. In 2017, the last year of FBI data, there were 7,105 Americans murdered by handguns and 374 by all rifles (only a fraction of which were AR-15s.) More people were killed by fists. The relative safety most Americans enjoy in their everyday lives happens to be an inconvenient reality in politics. That is why one of the most controversial things you can tell people these days is: Hey, things aren’t that bad. Photo Lipman Family Professor of Criminology, Law, and Public Policy at Northeastern.